Effects: relaxing, calming, antidepressant, refreshing, tonic, immunostimulatory, antiseptic, bactericide, disinfectant, antispasmodic, skin hydrating and nourishing, regenerating. Benefits: "Smiley oil" - a powerful antidepressant, it is cheering and up-lifting, joyful and warming. It is recommended in cases of anxiety, stress and depression; It stimulates the body metabolism, aroma baths or massages with orange oil are beneficial against cellulites, obesity, oedemas; Often used to flavor the indoor air. 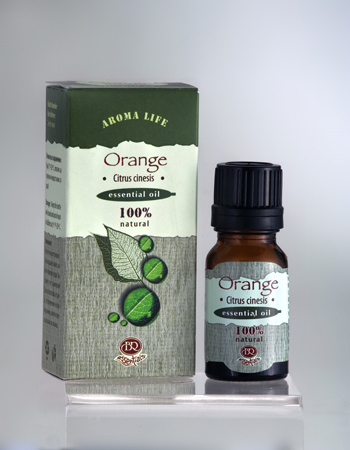 The orange oil is beneficial for cleaning the skin and whitening pigment spots; it stimulates the cell regeneration, improves the face complexion. The oil might be added to cosmetic creams, balms, lotions, moisturizing facial masks and masks for oily hair. Blends well with other citrus oils, sandal, neroli, salvia, geranium. Use: aromalampa, inhalation, gargle, air fresheners, bath, massage. Attention: Contraindicated for epileptics, hypertonic patients, nursing mothers, pregnant women and people with individual intolerance to orange. Phototoxic at direct contact with the sun. It is not recommended before sun exposure, as well as in combination with alcohol consumption. To be used in low concentrations.